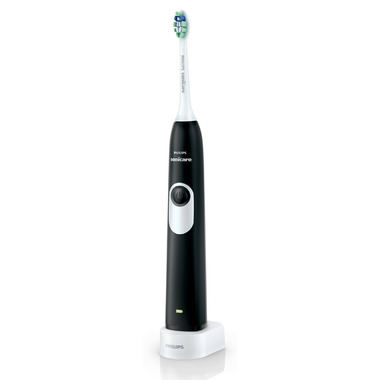 The Philips Sonicare 2 Series Plaque Control Electric Toothbrush removes up to 6X more plaque than a manual toothbrush with better access to back teeth. Brushing twice a day, every day, with this brush can help reduce cavities. The sonic technology creates a unique dynamic cleaning action that drives fluid deep between teeth and the gentle motion is safe for dental work, including orthodontics, implants and veneers. This a great toothbrush, and best price around. This is my second Sonicare brush in 7 years (first one's motor died recently) and I love them. The only reason I did not give this five stars is because the body is hard plastic with no rubber "grips" around it. I dropped this brush the first time I used it (I use a lot of water when I brush! ).